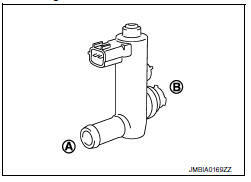 P0447 VENT CONTROL VALVE (Evaporative emission system vent control circuit open) An improper voltage signal is sent to ECM through EVAP canister vent control valve. Start engine and wait at least 8 seconds. Is 1st trip DTC detected? YES >> Proceed to EC-301, "Diagnosis Procedure". Turn ignition switch OFF and then turn ON. Select вЂњVENT CONTROL/VвЂќ in вЂњACTIVE TESTвЂќ mode of вЂњENGINEвЂќ using CONSULT. Touch вЂњON/OFFвЂќ on CONSULT screen. Check for operating sound of the valve. Disconnect EVAP canister vent control valve harness connector. Check the voltage between EVAP canister vent control valve harness connector and ground. Check the continuity between EVAP canister vent control valve harness connector and IPDM E/R harness connector. Check the continuity between EVAP canister vent control valve harness connector and ECM harness connector. NO >> Replace EVAP canister vent control valve. Refer to FL-15, "Removal and Installation"
Is it rusted? 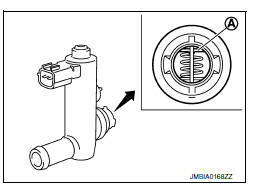 YES >> Replace EVAP canister vent control valve. Refer to FL- 15, "Removal and Installation".